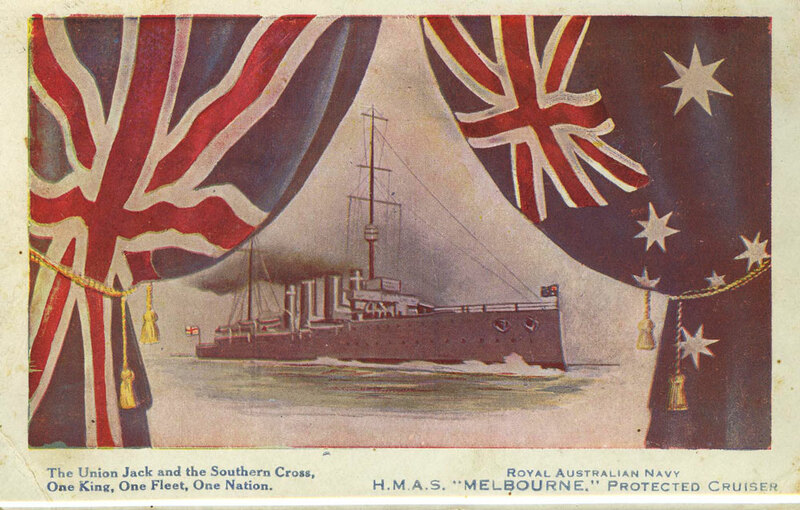 Lindsey Shaw, formerly a Senior Curator at the Australian National Maritime Museum, starts a series of four articles on the history of the Royal Australian Navy starting with a piece on the International Fleet Review. This weekend, October 3-11, Sydney will host an International Fleet Review to celebrate one hundred years since the Australian Fleet Unit – the genesis of the Royal Australian Navy (RAN) – proudly and loudly entered Sydney Harbour to a tumultuous welcome by Sydneysiders. It was a sign of Australia’s nationhood and an indication of a strong independent future. 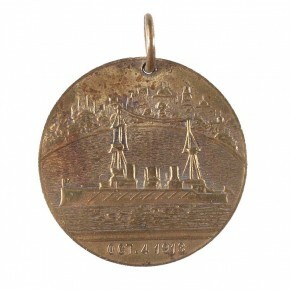 The purpose of this naval unit was to defend Australia and to support the rest of the British Empire as and when required. At Federation the various aging naval ships from the colonial state governments were known collectively as the Commonwealth Naval Forces and they were adequate for coastal defence but fell short of being a naval force with which to be reckoned. 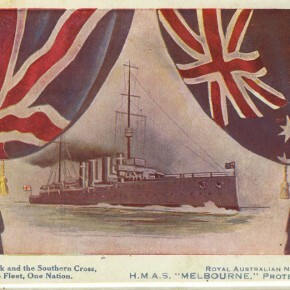 Our own navy was required and at the Imperial Defence Conference of 1909 it was decided that a battle cruiser, second-class cruisers, destroyers and submarines would be constructed to form an Australian Fleet Unit. Between 1909 and 1916 the destroyers Parramatta, Yarra, Warrego, Torrens, Swan and Huon; the battleship Australia; the light cruisers Melbourne, Sydney and Brisbane; and the two submarines with the latest technology, AE1 and AE2* were constructed. To maintain this new navy bases, repair and victualling yards were set up to support the fleet; naval schools and colleges were established to train Australian men and boys to be officers and sailors of an Australian navy. This fledgling navy replicated the British Royal Navy in hierarchy, organisation and structure but went on to create its own style and its own rich and proud history. Every detail was carried out with the mechanical precision of a clock work. It was all highly creditable to the young Navy. 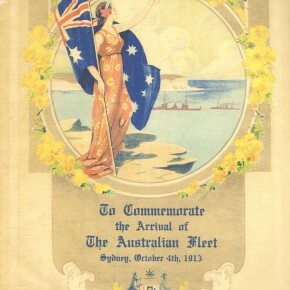 To remind Australians and an international public of the significance of this event a ceremonial fleet entry will be held on Friday 4 October 2013 at 10.00 am, when HMA Ships Sydney, Darwin, Perth, Parramatta, Bundaberg, Diamantina and Yarra will represent the original seven ships of the Australian Fleet Unit. The RAN will host a series of commemorative events and activities over a nine-day period on the harbour and around Sydney under the banner of the International Fleet Review. From 3-11 October, Sydney will be hosting navies from around the world. Alongside our 20 RAN ships there will be at least 23 international warships, 17 tall ships and an aviation program featuring at least 13 types of helicopters and aircraft. Sydney will be abuzz with sailors and ships, bands and parades, flypasts and fireworks. Click here for all the details of what’s happening on the harbour and at the Australian National Maritime Museum over the next week. It is an event not to be missed! Are you related to one of the men from the RAN’s 1913 fleet? The Royal Australian Navy is asking, ‘Are you a direct descendant of an officer or sailor who sailed into Sydney Harbour on 4 October 1913 aboard one of Royal Australian Navy’s first fleet units?’ If so, they’d like to hear from you. Click here for more details.